Call 03 9781 5171 or email for a free product brochure and price list. The Herbalife range of quality products aims to provide the elements every body needs on a daily basis to maintain optimum health. 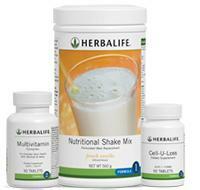 Herbalife maximises your nutrition intake through unique formulations and select, high quality ingredients. Herbalife Formula 1 (F1) Shakes are full of the goodness your body needs and they taste delicious with a range of great flavours. Whether you want to lose, gain or maintain your weight, Herbalife F1 Shakes are a convenient and healthy meal alternative that is both quick and easy to prepare. Herbalife Formula 2: Herbalifes Multivitamin Complex contains essential vitamins and minerals to help you achieve your RDI. Calcium and Magnesium is essential for nerve and muscle function. Formula 3: Personalised Protein Powder. An easy way to boost your protein intake. Add it to your Formula 1 shakes or try sprinkling into yoghurts, soups and casseroles. This delicious low-calorie tea mix can be savoured throughout the day for a natural lift. It includes the thermogenic and antioxidant properties of green tea, making it ideal as part of a nutritious weight-loss programme. Enjoy daily as a tasty and healthy alternative to coffee and sodas. Includes green tea and specially selected herbal extracts. A choice of 2 refreshing flavours: Original & Peach. Made from Aloe Leaf, Herbal Aloe Concentrates are a refreshing beverage option. Available in 2 flavours to give water a thirst quenching twist. Original flavour provides a citrus taste, whilst Mango flavour provides a sweet and fruity taste. When added to water, Herbal Aloe Concentrate provides a refreshing taste which may help to promote increased consumption of water. This may therefore, help you to achieve the recommended fluid intake of 2 litres of water per day. Herbalife's Protein Bars are high in protein and a convenient snack option. Available in 3 delicious flavours. Each bar, on average has 134Cal (561kJ) and 10g protein per bar. High protein contribution from these bars can help you to build lean muscle mass and ultimately contributes to an increased metabolic rate. Cell-U-Loss® supports the healthy elimination of water, aids in promoting the appearance of healthy skin and the healthy activity of the urinary tract. Instant Herbal Beverage is a delicious and refreshing tea, which can be served either hot or cold. Enjoy refreshing Herbal Instant Beverage whenever you want a boost. Helps support weight management as it is low in calories. Combines ancient herbal wisdom with modern day ingenuity to contribute to your well-being and helps support normal vitality. Green tea is known for its natural antioxidant properties and studies have shown that regular consumption can benefit your wellbeing. Your Independent Herbalife Distributor suggests a programme based on your individual needs that will help you achieve your ideal shape for optimal weight loss results. The Herbalife programmes includes delicious meal-replacement shakes that are packed with nutrients and which can be personalised with the right amount of protein your body needs to control hunger. The meal plan also allows you to eat a variety of your favourite foods, colourful fruits and vegetables, healthy carbs, lean protein and protein snacksall of which help keep you feeling great as you lose weight. Your Independent Herbalife Distributor optimises your success with motivational support, advice on exercise, tips on healthy eating, weight-loss tracking and more! Your coach can also recommend enhancersdietary supplementsthat can help you overcome personal weight-loss challenges, such as cravings, low energy and digestive upset, making weight loss even easier. Discover the power of personalisationpersonalised protein, a personalised meal plan and personal coachingto help you get lean and stay that way, with Herbalife it is as easy as 1,2,3. At Herbalife we understand how difficult and expensive it can be to take that first step toward a healthier lifestyle and shaping up. With that in mind Herbalife has put together a Shape Up Now Programme, consisting of three easy to use special products designed to have you looking great. Designed to help you start on the road to a better and healthier new you. The Starter Programme gives you the option to personalise with targeted nutritional supplements and additional protein based on your individual needs. A programme to give you a headstart. This herbal combination utilises the properties of specially chosen ingredients designed to support a healthy and active lifestyle. Improvements in a healthy lifestyle will encourage your metabolic processes giving you a natural daytime lift. Try it and feel the difference! The Advanced Programme provides a combination of products to help shape and tone your body. Get started on the path to a new you with balanced nutrition for optimum health! Includes all the components of the QuickStart Programme PLUS Instant Herbal Beverage. We have combined science and nature in our Ultimate Programme to help put you in complete control of your shape. As your body reaches optimum health through safe and effective nutrition, youll begin to reap the full benefits of your new lifestyle. Achieve your bodys true potential with the very best shape-up products. Includes all the components of the QuickStart and Advanced Programmes PLUS Florafibre and Herbal Aloe Concentrate.